Peel the onion and cut into ¼-inch-thick rounds. Cut the pears lengthwise into quarters and cut away the cores. Cut the fruit into ¼-inch-thick slices. Strip the rosemary leaves from the stems; coarsely chop the leaves. On a sheet pan, toss the onion and pears with the rosemary and 2 to 3 teaspoons oil; season with salt and pepper. Spread in an even layer and roast, stirring halfway through, until the onion and pears are caramelized, 18 to 20 minutes. While the onion and pears roast, prepare the cauliflower mash. Finely chop, press, or grate enough garlic to measure 1 teaspoon [2 tsp]. In a large frying pan over medium heat, warm 1 to 2 teaspoons oil until hot but not smoking. Stir in the garlic and cook until fragrant, about 1 minute. Add the cauliflower “rice,” season with salt and pepper, and cook, stirring occasionally, until the cauliflower starts to soften, 3 to 5 minutes [4 to 6 min]. Remove from the heat. Using a fork, masher, or the back of a spoon, mash to the desired consistency. Season to taste with salt and pepper. Cover partially to keep warm. While the cauliflower cooks, prepare the chicken. In a large frying pan over medium-high heat, warm 2 teaspoons oil until hot but not smoking. Working in batches if needed, add the chicken, skin side down, and cook until the skin is well browned, 5 to 6 minutes. Turn and cook until the meat is firm and cooked through, 3 to 5 minutes. Transfer to a plate. Add more oil between batches if needed. While the chicken cooks, finish the roasted onion and pears. In a medium bowl, stir together the roasted onion and pears, olives, and parsley; season to taste with salt and pepper. Transfer the cauliflower mash to individual plates and top with the chicken. Serve with the roasted onion and pears. Toss the onion and pears with oil and seasonings. 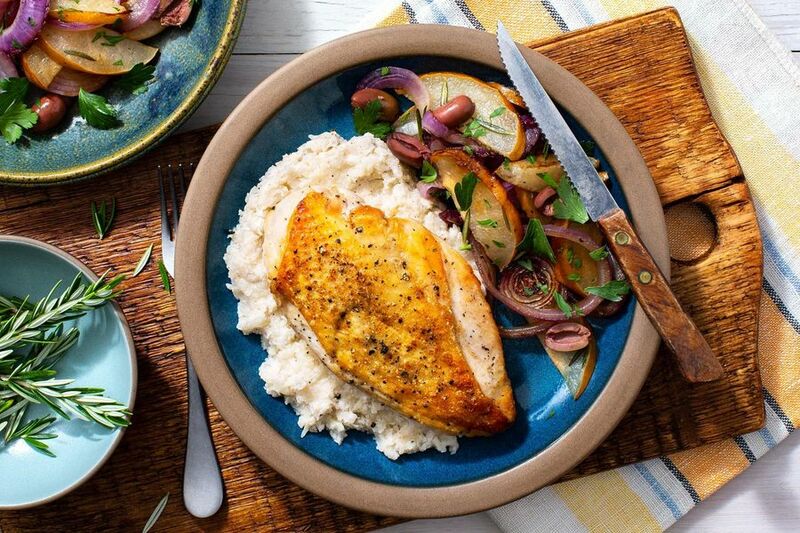 Chicken breasts and a cauliflower mash become an elegant autumnal meal with rosemary-scented onion and pears served alongside. To get the chicken skin browned and crisp, dry the skin and meat as thoroughly as possible and give the pan and oil plenty of time to heat before you start cooking. In Step 3, remove the chicken skin after cooking to ditch about 40 calories and 5.5 grams of fat per serving. Calories: 690, Protein: 41g (82% DV), Fiber: 15g (60% DV), Total Fat: 38g (58% DV), Monounsaturated Fat: 64g, Polyunsaturated Fat: 12g, Saturated Fat: 6g (30% DV), Cholesterol: 110mg (37% DV), Sodium: 740mg (31% DV), Carbohydrates: 49g (16% DV), Total Sugars: 26g, Added Sugars: 0g (0% DV).